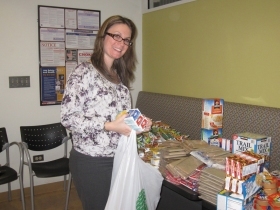 Marquette Bank recently wrapped up its 7th annual Adopt-a-Soldier Program, sending over 80 care packages to US soldiers from Illinois and stationed overseas during the Christmas season. The independent neighborhood bank located in Orland Park collected donations from customers, employees and community members in order to spread good cheer to those bravely fighting for our country. The care packages included snacks, personal hygiene products, DVDs, games, calling cards and other items not readily available on military bases. Community organizations also contributed handmade cards and letters in the care packages, including Linda Primozic’s 3rd grade class at High Point High School, Champions After School Program at Centennial School, Sandbox School and Ladies Bible Group at Parkview Christian Church. The Adopt-a-Soldier Program is part of Marquette Bank’s Neighborhood Commitment, a charitable initiative in which employees focus on different areas of need such as shelter, hunger, education and health and wellness.